In this tutorial you will learn how to create the database driven login form in Spring 4 Framework using the Spring MVC module of Spring framework and the Hibernate framework. We are using MySQL Database for storing the login details of the user. 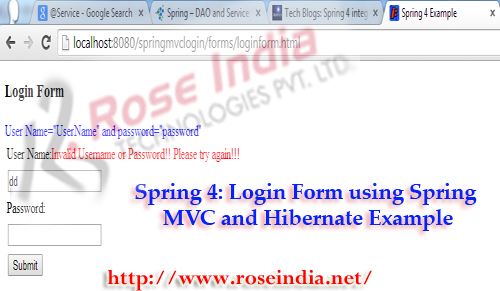 Spring 4 MVC Login Example: Database driven login form using Spring MVC and the Hibernate ORM framework. In this last tutorial we have discussed how to make Login form application in Spring MVC 4. In this section we will teach you how to validate the user against database. MySQL database server is used to store the login details of the user. Hibernate ORM framework is used to access the database. We are using the code discussed in the tutorial Spring 4 MVC Login form without database. Here are we are adding/modifying the code for validating the user against the data stored in the MySQL database server. You can download the code from the above tutorial and follow the instruction to add the database capabilities. So, let's get started with the development of the application. Now our database is ready, so the next step is to create the model class. This Entity is mapped to the "users" table. Here we have used the Hibernate Query Language (HQL) for validation the user against database. This is class also registered to the repository with the help of @Repository("loginDAO") tag. In the above interface the checkLogin(..) method is defined which will be implemented in the LoginServiceImpl class. The service is calling the checkLogin(...) method on the loginDAO class. In the LoginController.java class we have to modify the validation logic to use the service class for validating the user. Here is the complete code of the LoginController.java class. NotEmpty.validationForm.userName=User Name must not be blank. Size.validationForm.userName=User Name must between 1 to 20 characters. Size.loginForm.userName=size must between 1 to 50 characters. Size.loginForm.password=size must between 1 to 20 characters. NotEmpty.registration.password=Password must not be blank. Size.registration.password=Password must between 4 to 20 characters. invaliduser=Invalid Username or Password!! Please try again!!! In the following code you can see the bean definition for mysql "dataSource" and the "sessionFactory", these will be used in the DAO classes. The tag <property name="annotatedClasses"> tells the spring to load the Entity classes. The tag <context:component-scan base-package="net.roseindia"></context:component-scan> is used to scan for the annotated classes. After war file is created you can copy it to your Tomcat server and run there. 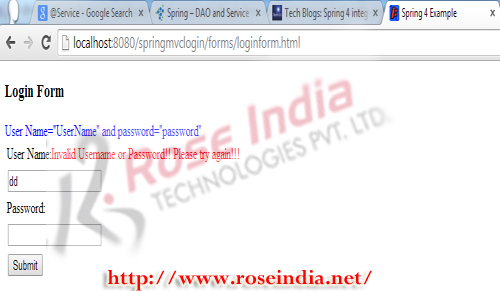 So, in this section you have learned how to make Spring 4 MVC login form example and validate against database. Hibernate is used to access the MySQL database server. Click: Download the Source of the Tutorial in the Eclipse Project format. Download the source code of the Spring 4 MVC login form example with backend database validation using Hibernate Framework. Check more Spring 4 Tutorials.